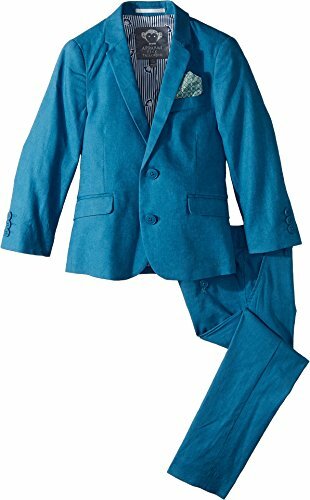 Appaman Kids' Size Chart Have your little one channel the chic days of yesteryear in the Appaman™ Kids Two-Piece Mod Suit. Two-piece suit with a slim European cut, crafted from a sleek stretch-cotton fabrication for a streamlined, modern look. Jacket: Slim notch lapel. Left chest besom pocket with a built-in pocket square. Long sleeves with three-button close on cuffs. Double-button front closure. Seamed front flap pockets. Lined with brand logo fabric. Trouser: Belt loop waistband. Slash hand pockets. Zip-fly with a hook and bar tab closure. Additional information: 98% cotton, 2% spandex;Lining: 100% polyester. Dry clean only. Imported. Measurements: Length: 22 in Sleeve Length: 19 in Waist Measurement: 22 in Outseam: 24 in Inseam: 15 in Front Rise: 9 in Back Rise: 9 1⁄2 in Leg Opening: 9 in Product measurements were taken using size 5 Little Kids. Please note that measurements may vary by size. Have your little one channel the chic days of yesteryear in the Appaman™ Kids Two-Piece Mod Suit. Two-piece suit with a slim European cut, crafted from a sleek stretch-cotton fabrication for a streamlined, modern look. If you have any questions about this product by Appaman Kids, contact us by completing and submitting the form below. If you are looking for a specif part number, please include it with your message.